UPDATED: Fri., Dec. 14, 2018, 8:45 p.m.
Statewide organizers operating under the Women’s March banner announced this week that they are dissolving their group in protest of national leaders’ association with speakers seen as anti-Semitic. The decision won’t affect plans for a third annual downtown march in Spokane next month, local organizers stressed Friday. Angie Beem, a Spokane Valley resident who served as board president of Women’s March Washington, announced the dissolution of the state group on Facebook on Thursday, citing the national organization’s ties to Nation of Islam leader Louis Farrakhan. Beem, who helped organize the march in Spokane in 2017 and made an unsuccessful bid for Spokane Valley City Council that fall, said in an interview Friday the decision to disband wasn’t easy. “It’s heartbreaking. Whenever you create something that literally changed your life, it’s really hard to walk away from it,” Beem said. 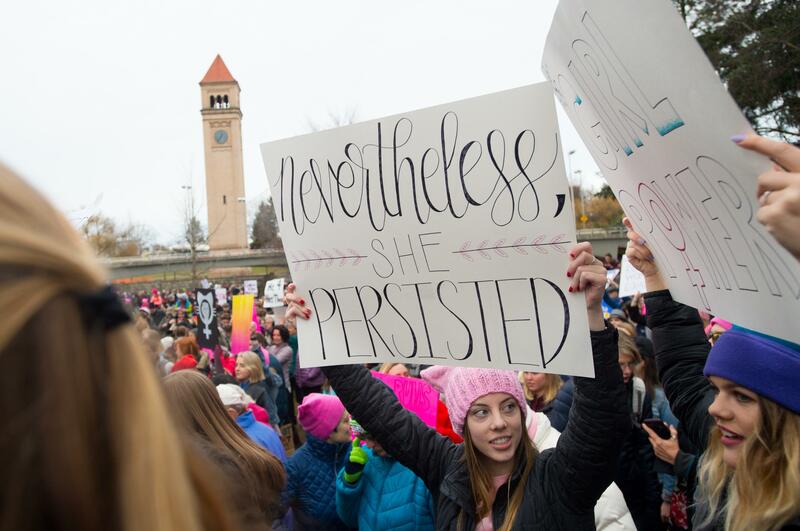 Local organizers knew the state organization was considering disbanding after planned marches in January, said Lori Feagan, an organizer with Spokane Women’s March. But they were unaware a public announcement would be made this week, she said. In November, the local group put out a statement denouncing anti-Semitism, transphobia and any groups supporting those prejudices. Local organizers plan to rally from the Spokane Convention Center on Jan. 19 at 10 a.m. The event drew 8,000 demonstrators in 2017 and 6,000 last year amid concerns the event would be canceled. Beem said state organizers were not only uncomfortable with the national leaders’ ties to Farrakhan, whose group, the Nation of Islam, has been labeled as an anti-Semitic hate group by the Southern Poverty Law Center. They’re also concerned about the national organizers’ finances and what Beem called a “fame-hungry” attitude. The four leaders of the national Women’s March group – Bob Bland, Tamika Mallory, Carmen Perez and Linda Sarsour – have received calls to resign, even as they released statements condemning anti-Semitism. One of the calls for resignation came from Teresa Shook, a retired lawyer whose Facebook post following the 2016 presidential election is widely credited as spurring the Women’s March movement nationwide. Members of the state Women’s March group will instead direct their efforts toward Smart Politics, Beem said Friday. The national nonprofit bills itself as a progressive organization that aims to promote civil discourse. “If we can’t talk to each other, we can’t move forward,” Beem said. The state organization is urging donors to continue to contribute funds to support local marches, including the one in Spokane, Beem said. Published: Dec. 14, 2018, 4:30 p.m. Updated: Dec. 14, 2018, 8:45 p.m.